We remember with fondness our first trip to Penang with our older son Z. He was 4 months old. We went with his Ye Ye and Nai Nai, and it was a carefully chosen destination - a not too long plane ride, and accessible tourist spots. Even then, I was still a little anxious about how it would turn out - whether he would experience pressure on the flight, and if he would sleep well in a new environment. I remember how he decided to soil his diaper immediately upon take off, and me wrestling with a dirty nappy and a squirming infant on the tray table in front of me instead of my dinner. Z's first trip overseas at the age of 4-months - Penang, Malaysia. Looking back, I think the trip opened Mark's and my eyes to how enjoyable it was to travel with our children. I remember walking through the local spice gardens and seeing how he reached wide-eyed for every plant and explored the texture of dried leaves on a bench, and the look of total trust as he appealed to Daddy for help upon meeting his first wave on a sandy beach, tiny toes curling upon contact with hot sand. 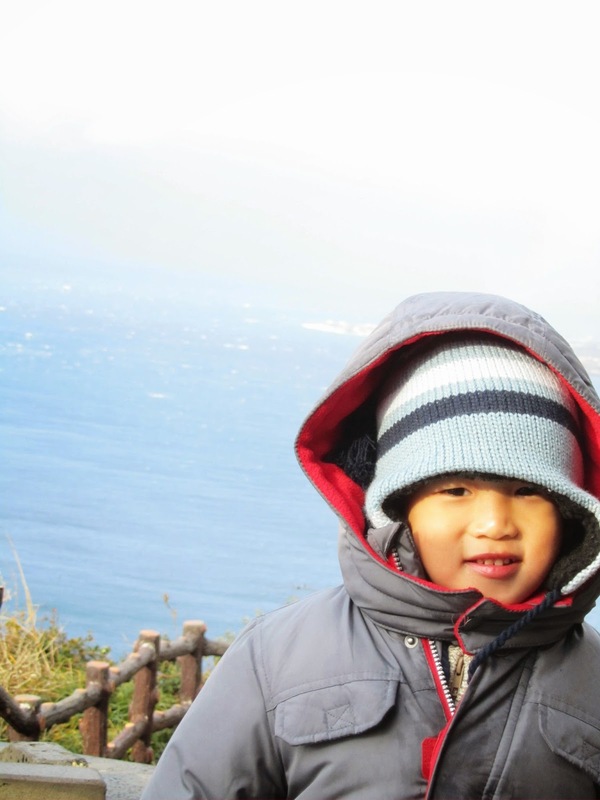 We realized how much we enjoyed exploring the world with our child, and seeing the beauty through his eyes. Fast forward two years, and our older son had travelled with us to almost ten destinations, ranging from Brisbane to visit his Grand Aunt Lil, to the Malaysian East Coast with good friends; also Hanoi, Vietnam, and Phuket, Thailand. One of our all-time favourite trips - a 3-week vacation to Melbourne and Brisbane, Australia when Z was 8-months-old. It was pure delight to see how much Grand Aunty Lil loved him! Not only will he be able to say in future that he was a well-travelled little boy, but we will have some fun tales of excitement to tell of his first motorbike ride at 17 months up a 45-degree incline on a bumpy Vietnamese mountain road, swerving side to side in his Daddy's backpack. And there was Z's 10-hour train ride to Sapa on sleeper bunks, with a cabin shared by a strange American man and his Vietnamese girlfriend on the upper bunks (yes, we were crazy, trying to save some money). There was of course his first cruise in Halong Bay on the Emeraude, a majestic cruise ship, where his Daddy and Mummy were dragged up to waltz to a live orchestra playing oldies, while the little boy was passed around among the fellow passengers who had been waiting for an opportunity to babysit. His little brother arrived soon after, and we had to figure out all the logistics again. 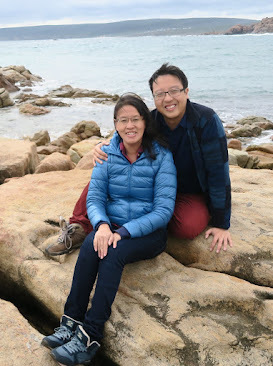 By then, we had truly caught the travel bug, so as soon as we had the baby's passport made, off we went again to Taiwan when the baby was about 5 months. Our early traveling memories of E were of him asleep in his carrier with the top of his head peeking out, and not much else. I recall the amusing story of my mother trying to mix a bottle of formula in the middle of the night, shaking it too vigorously only to have the milk spray onto my poor younger sister, who had a rude awakening in a baptism of milk. We decided after that to have both our families sleep in separate rooms (as far as possible of course)! Taiwan trip 2012, when E was only 5-months. Thankful for the help of family on our travels.
) came in very handy. As they grew older, we had to figure out how to manouver two suitcases, a stroller, two backpacks, a preschooler and a toddler, specifically from the airport conveyer belt to the train or taxi, and into our hotel room. And back again in the reverse order on our way home. I like to joke that it's kind of like a military operation. Mark carries one of them on his back in our trusty Kelty, which we also use on the treks we do on our trips, while manouvering one stroller and a suitcase; I manage the other, while carrying another backpack and rolling a suitcase along as well. I recall our journey back to the airport on one of Japan's high speed trains; there were no more seats in the cabins, so our family hunkered down on the floor in between the carriages, and enjoyed a snack and some colouring time on the way to the airport! sits comfortably in the backpack. 1. Take it easy and slow. After feeling the strain of our Vietnam trip, we decided that we are no longer as young as we used to be! Gone were the days when we could rough it out in a SGD20 a night hotel; and what on earth were we thinking, taking our baby on a 10-hour train ride in a cabin shared with total strangers? Try pushing two kids in a stroller against the flow of the traffic in Ho Chi Minh City! We have since wised up, and try to stay at least two nights or more in one accommodation, we try not to have them in the car for too long a distance, and we stay in relatively decent accommodation so that all of us will have a good night's rest. We also know that our boys need to work off their energy, so wide open spaces are best for holiday choices; shopping and eating trips are reserved only for when we go without the boys. I remember feeling so sorry for our older one when he wanted to get down from my carrier and walk, but could not as the streets of Vietnam were simply too crazy. We also plan our holidays with kid-friendly destinations in mind - I love bringing them to museum exhibitions and Science centres, parks, farms and fun fairs. climbed the iconic Seongsan Ilchulbong peak mostly on his own. 2. Pack wisely but lightly. - A collection of CDs, MP3 songs and audio books for long car rides. A favourite on our receht Perth trip was Peter and the Wolf! Mark and I naturally take on different roles in our travel plans. I am in charge of the nitty gritty stuff eg. bringing vitamins for everyone, planning the hotel choices, sights to see etc. My ex-Scout husband takes care of packing the multitude of stuff I have requested that he bring, and throwing out whatever he thinks redundant. As the sole driver, he also looks into the routes and feasibility. Driving the Lims. Mark is pictured here making a 2/1/2 hour drive from Busselton to Pemberton, Australia. 4. Keep the end in mind - Enjoying family time together. We have learned that it's not all about finishing everything in our itinerary. Young children have many needs: rest, food, comfort. There are meltdowns to deal with as a result of new environments and out-of-the-norm routines. We have learned to take it slow and enjoy the time we have together. One of the best trips we had with our older son was in Phuket and Krabi, where we took things easy for two whole weeks and just focused on spending time together. Precious time with the family in Kurashiki, Japan. We may not realise it, but often that's what makes a holiday special for our kids - yes, the sights they see will open their eyes to a beautiful world with different cultures and people, and they may also learn to adapt and treat others with respect, but holidays are above all for us a time away from the daily grind, a time to get to know one another as a family once more, and to just have fun together building a lifetime of memories. Do share some of your favourite travel memories with us! 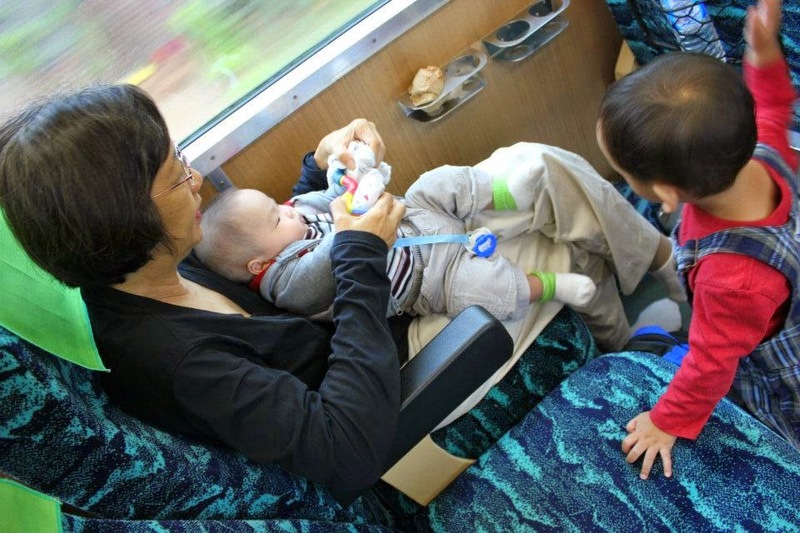 We would love to hear your tips for traveling with young children as well!